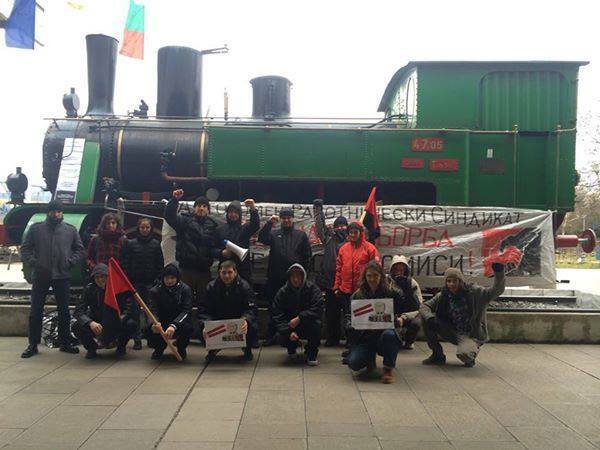 On-going actions in defense of Bulgarian railways from depredation and privatization have been carried out by activists of the Autonomous Labour Union (ARS, a friend-affiliate of the IWA-AIT). On January 31, for the third Saturday in a row, they set up protest pickets – this time in Varna and in the capital Sofia. In Varna protesters set up shop at the main railway station, demonstrating their opposition to plans for the secret privatization of the railways. The demonstrators say that the decision to cancel a number of trains (later rescinded) was only an attempt to “test the waters”. According to protestor Yevgeny Nikitin, it is intended to carry out privatization with the aid two surreptitious measures. First, the transfer as concessions of lines capable of being profitable. Secondly, the transfer of railway funds to municipalities, which will distribute them among private carriers. Krasimir Dmirov blamed the top officials of the railway administration for the deplorable state of the railways. He emphasized that ordinary workers do not bear any responsibility for this, in spite of propaganda claiming the opposite. The ARS demands a complete re-organization of the railway system. Their management should be elected in inter-union elections – directly by the workers themselves, and not by parties. The official trade unions should be placed under control of the workers themselves and the workers should take part in decision making by means of “direct democracy” (http://varna.topnovini.bg/node/568118). The photo shows demonstrators of the Sofia section of the ARS protesting cuts and advocating for self-management of the railways. Thanks to aitrus.info for this information.